Corozal, C.Z. 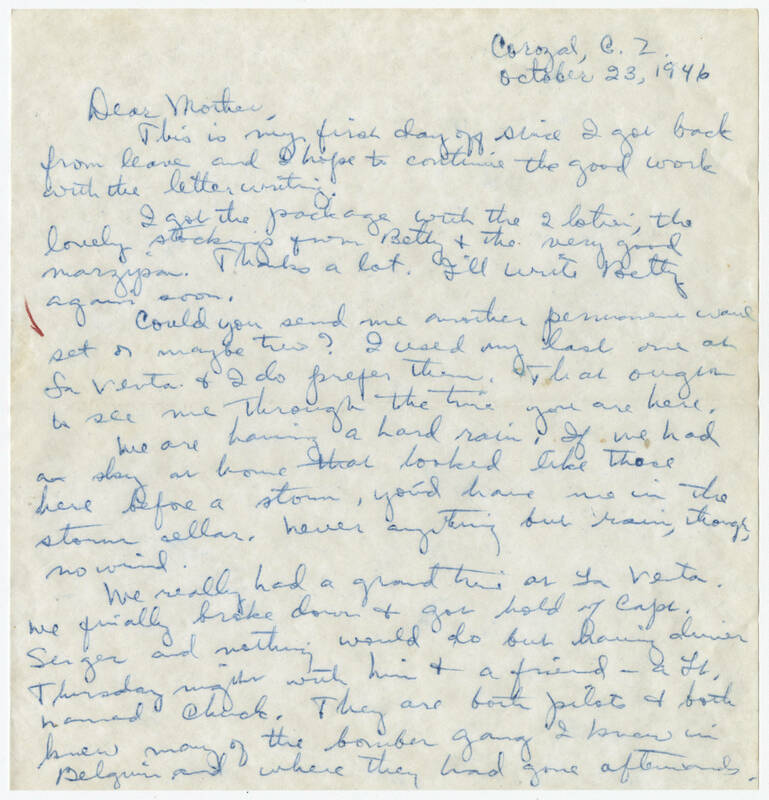 October 23, 1946 Dear Mother, This is my first day off since I got back from leave and I hope to continue the good work with the letter writing. I got the package with the 2 [lotions? ], the lovely stockings from Betty & the very good marzipan. Thanks a lot. I'll write Betty again soon. Could you send me another permanent wave set or maybe two? I used my last one at La Venta & I do prefer them. That ought to see me through the time you are here. We are having a hard rain. If we had a sky at home that looked like those here before a storm, you'd have me in the storm cellar. Never anything but rain, though, no wind. We really had a grand time at La Venta. We finally broke down & got hold of Capt. Singer and nothing would do but having dinner Thursday night with him & a friend -- a Lt. named Chuck. They are both pilots & both knew many of the bomber gang I knew in Belgium and where they had gone afterwards.